“Elton” (Bennie & The Jets) and “Billy Joel” (Mike O’Brien & Storm Front) perform all of the legends hits in a fantastic, realistic tribute to the world-famous hitmakers! “Bennie and the Jets is the world's premiere Elton John Tribute. 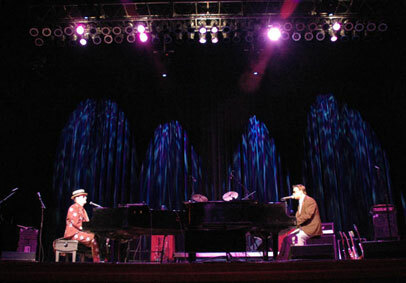 They are led by Greg Ransom whose vocals, on stage mannerisms, and piano playing are exactly like those of Elton John. Named after Billy Joel’s monster 1989 album, Storm Front, with vocalist, Mike O’Brien is “the real-deal Billy Joel!” For an unforgettable evening with the greatest music of all time, book "Face2Face”!